Get on your 8-bit! It's like you've jumped straight out of an NES game starring a geeky version of Tom Selleck when you wear this Pixel 8-Bit Man Mask! This handsome mask features an older gentleman with an impressive moustache and thick eyebrows wearing some awesome bifocals. 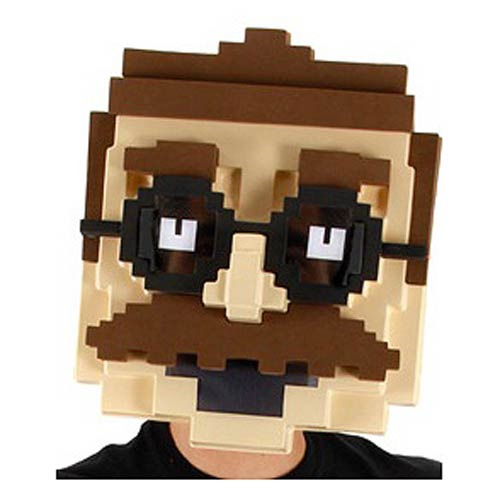 If you've ever wanted to cosplay as a video game version of your dad given an NES or Sega Genesis makeover you'll have fun with this Pixel 8-Bit Man Mask! Ages 14 and up. The mask is 14 inches tall.